It is a happy, and surely not accidental, coincidence that this presentation of his work at Tate Britain appears at the same time as their major exhibition Art and Empire which explores the relationships, as expressed in art, between the colonial power, Britain, and its once subject peoples. As Mark Brown (Guardian) observed in connection with this engrossing show: what more symbolically apposite venue for Art and Empire could there be than the Tate, which stands on a site where there was once a prison holding convicts en route to the colonies, later replaced by an art gallery founded on Henry Tate's transatlantic exploitation of sugar and slaves. Art and Empire shows how art served up colonial exploits as propaganda and spin to the domestic audience; how it absorbed and deposited cultural symbols and styles at home and abroad; and how the indigenous art of the colonised cultures adapted to survive and resist. The exhibition also has a chess set - by an anonymous Bengali craftsman/artist circa 1795. Its pieces are rendered as elephants and oxen etc., representing the rapacious (and ultimately incompetent) East India Company versus the local army of Tipu Sultan, ruler of Mysore (possibly just as corrupted by self-interest). It appears in a room titled "Imperial Heroics". The final room shows post-colonial art and the struggle of ex-colonial migrants to establish their identity, and express and re-assert once vibrant local cultures, even if now refracted through the lens of modern European "isms". And this is where Shemza and his search for his artistic truth might have been fitted in, if he hadn't been honoured with his own room elsewhere in the Gallery. 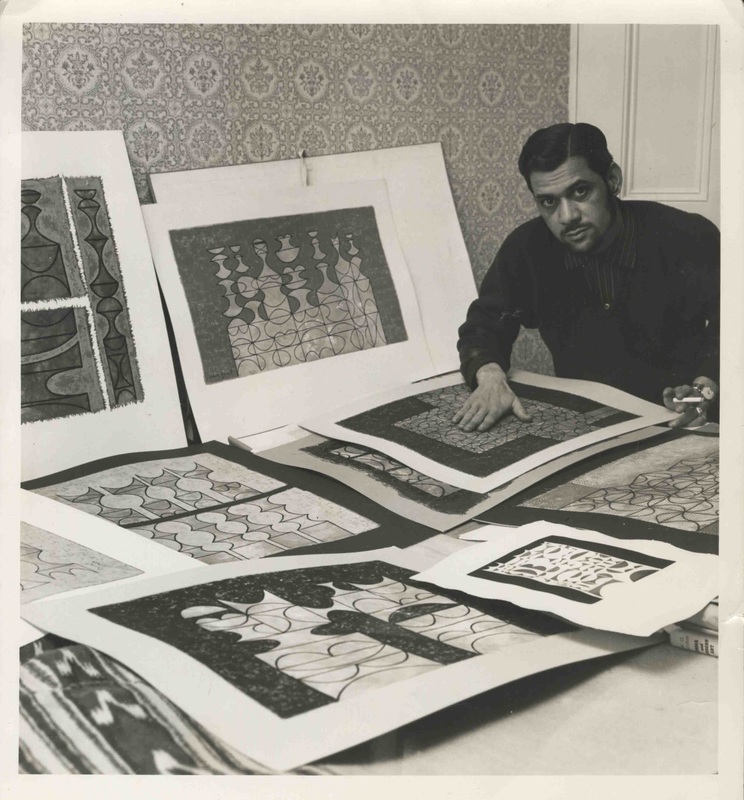 He was a polymathic designer, artist, novelist, journalist, script-writer, and teacher in Lahore, and an established member of the European inspired avant-garde in Pakistan (as you can read in this biographical note to which this post is indebted). In pursuit of new horizons he came to the Slade School of Art in London in the mid 1950s, but remained unrecognised - disavowing much of his earlier work - until he began to exhibit towards the end of the decade. In the meantime he married an English woman, and won a British Council Scholarship to continue his studies - and embraced such modernists as Paul Klee. 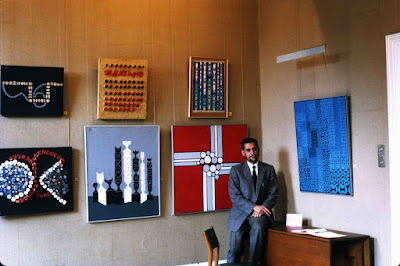 You can see the Klee influence in many of Shemza's works, including a sumptuous composition in his Tate room - the one on the right of the artist in this portrait photo taken in 1969. ... even if a crotchety syncopation disrupts the beat of what might be 4/4 time. In centre stage the notes flip negative to positive causing a figure to emerge from the ground - as if it's taking a solo. 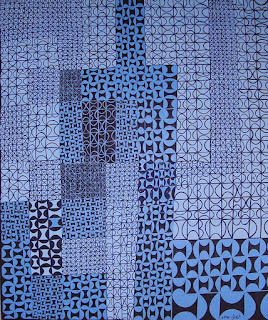 There's no chess here, unlike Klee's waltzing Übershach (1937) featured several times on the blog (see here and here), but there are the tell-tale arabesques associated with "Calligraphic Abstraction", as Shemza's style has been dubbed. But a Pakistani blowing the Blues? Just how more globalised, and post-colonial, could you get? 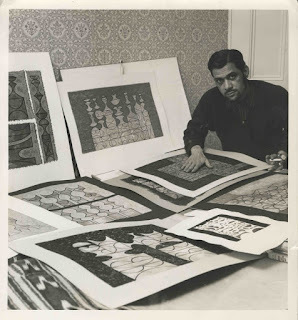 In 1960 Shemza returned to Lahore, but ended up in commercial advertising when his academic ambitions were frustrated - so back again he came, a year later, to England where he settled in the Midlands, teaching art in Salford. For the next twenty five years he worked in themed series exploring various graphic media - drawing, printing, engraving, and painting. Especially significant are "Meems" (from 1967) based on the first letter of the Prophet Muhammad's name, and - as far as this post is concerned - the earlier Chessmen series which surfaced in the 1960s (to which we turn next). All the while he exhibited here and abroad, including Pakistan - his prolific output conditioned by the culture into which he had been born, and the fundamental knowledge that, for him, home was Kashmir. The positive and negative calligraphic "Bs" and "Ds" are here apparently employed to imply female and male figures - but if so it would be exceptional in his oeuvre; as far as I can tell he eschewed direct human representation, perhaps for religious reasons, perhaps from a personal aesthetic. In the next work (taking them more or less chronologically) the number of structures multiplies, but here the pieces have no individual identities or surface decoration. The features of the series are being assembled: forms isolated from the backgound, arranged as if on a shelf - Morandi-style. In each work they appear as specimens, to inspect, admire, or even venerate; and as a group. 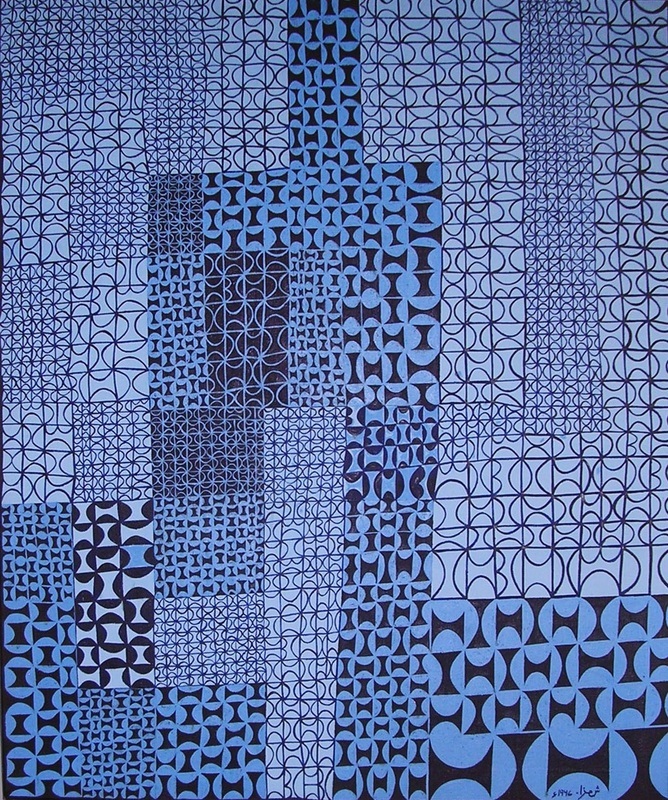 This is a far cry from the all-over integration of Blue Blue Jazz - and you might hesitate before calling them "abstract". The above precursors might count as "Chessmen zero". Here is a sequence of five from the ensuing series. 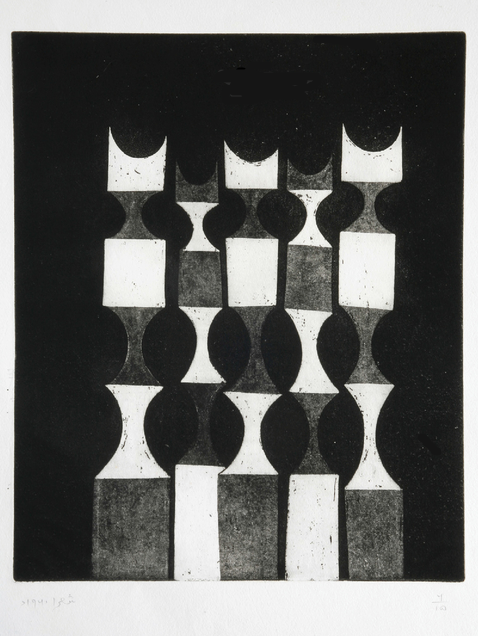 The first four (from the left), from the 1960s, are illustrated in the catalogue accompanying the Tate show - starting with Chessmen One. I have added a fifth from 1970 (because I like it). 4. 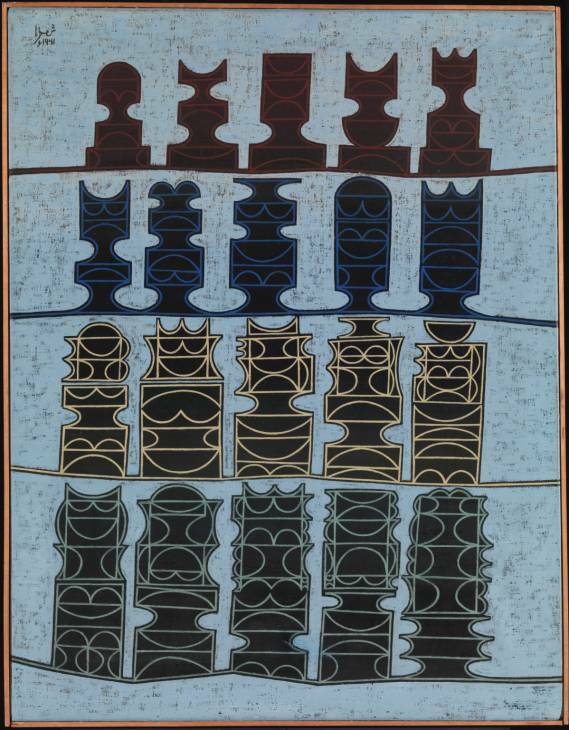 Chessmen (1969) Oil and silkscreen on cotton cloth 60 x 46cm © Shemza Estate; 5. Green Chessmen (1970) here. Seeing them together like this (click on to enlarge) allows us to "compare and contrast" both artistically and chessically. 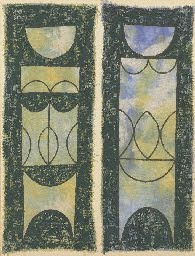 The series seems to evolve - left to right in date order - out of complexity towards simplicity, as if the congestion of One, and the pairings of Red and Ochre, called for the hieratic grandeur of the last three - two of which repeat a design, but resolve even further into a single positive colour: green. The series also leaves behind surface pattern in favour of the see-through effect seen in #2 (where positive and negative spaces play in the reflections above and below the horizon). Strictly speaking though, and without the artist's say-so, we shouldn't regard this series as a process of linear development. Yet, you get a strong sense of that, insofar as there is a trend in these works of individuals resolving and cohering into a tight-knit group - or a set, of course. 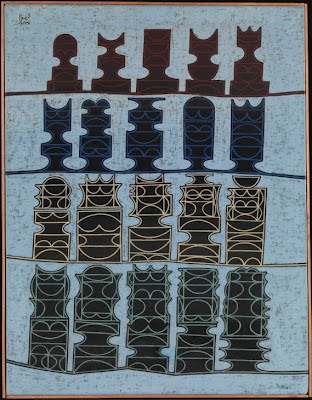 In fact the catalogue adds two more works in its "chess men" section, titled Family One and Two. And that is just how they end up: as a family of forms. Perhaps that is what Shemza was driven towards: the first of his two daughters was born in 1958, and the second in 1981 (the Family pieces in the catalogue are dated 1984) - if such a reduction of artistic inspiration to personal circumstance isn't going too far. But whether parents and children, Chiefs and Indians, or major and minor chess pieces (and pawns); they seem to have personality. 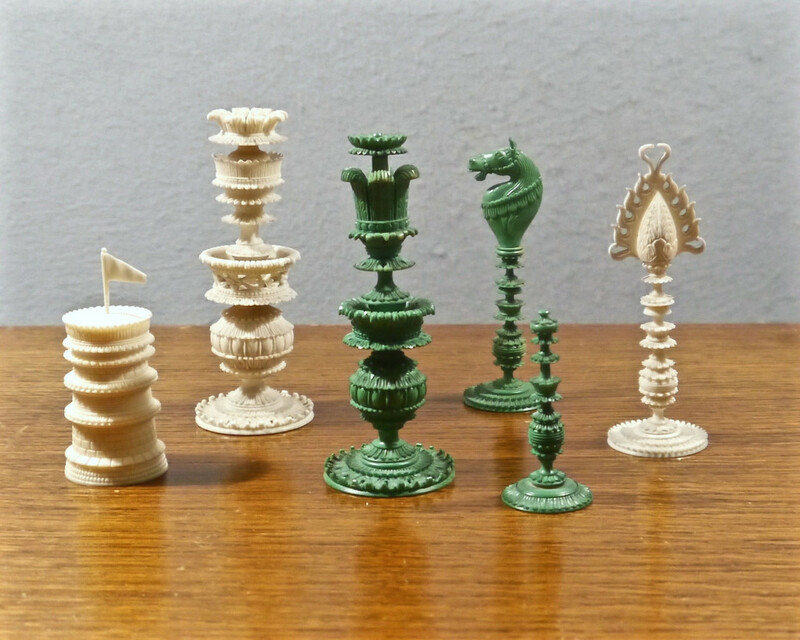 For me, I'm drawn to the image of the Green Chessmen for their disciplined bearing as they stand stiff on parade and confront the viewer from their redoubt. Actually the architectural allusion isn't too fanciful throughout: the inspiration of the watch-towers - military, civic, religious - of Lahore is also evident in much of Shemza's work. Perhaps we have already answered the question of "why chessmen": Shemza is exploring group identity, and the individual in the collective. 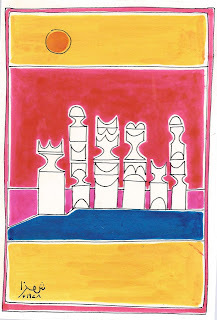 Aphra Shemza (his granddaughter) - who is also an artist - corroborates (kindly replying to my email queries) that there is a theme of family and community association to which the chess pieces happily lend themselves. Before we move away from the Chessmen, have a look at this, from 1978. 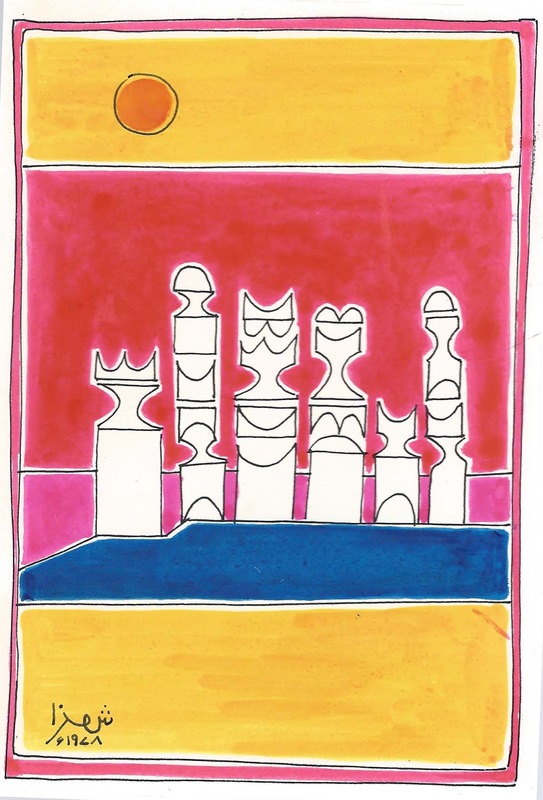 It is a piece of Klee-style playfulness, with a chess-family outing to enjoy a sunny afternoon beside the seaside. They seem to be smiling. It makes me smile, too. Naturally I asked Aphra whether her grandfather had played chess. Sadly not - which may explain his focus on the static imagery of the pieces, and not the action of the play or the players. Nor was there, it seems, a specific set that he used as a model; though as styles go he obviously wasn't thinking of the standard European Staunton pattern. Online I found these suggestive pieces of a chess set from India. 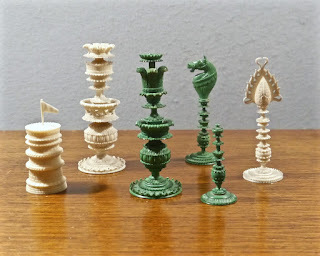 19th Century Vizagapatam ivory chess set. Note the absence of the cross - a Christian symbol - on the King, and the overall cylindrical form of the pieces, with circumferential embellishments just as in Shemza's paintings. This set, though, has a recognisable knight/horse piece which doesn't seem to appear in his works. That could be for any number of reasons, but the horse would seem not to be part of Islamic imagery, which is his well-spring: "I am a Muslim, brought up with Islamic traditions" he wrote in 1968. He also wrote in the same manifesto that "Calligraphy gives me more satisfaction than painting. Architectural form has more beauty than the human body." The second point may explain why he has chess pieces standing in for people. 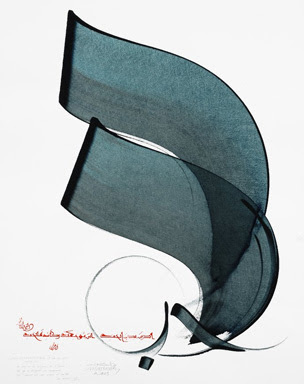 As for the first: we haven't really explored his more radically calligraphic works in this post (it would take us too far afield); but to get an insight into its importance in the tradition to which he subscribed I'd like to draw your attention to this piece of beautiful, and modern, calligraphic art by another hand. It is stunning in its graceful simplicity. It contrasts so profoundly in spirit with the joyless cultural vandals and nihilists now on the rampage in the name of the Prophet and his text. Sadly, some of our own imperialist forebears, who also claimed axiomatic authority from another such holy writ - see the Bible was the secret of England's greatness (it's on show at Art and Empire) - had little compunction in trashing cultures different from their own, and in this respect they set a poor example. 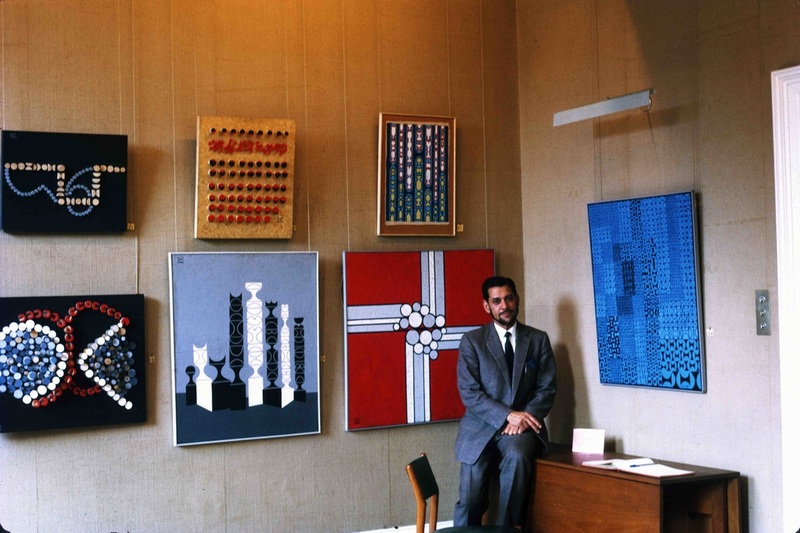 Let's finish this appreciation of Anwar Jalal Shemza - who proclaimed his Islamic faith as an inspiration for an affirmative, humanist, art - with a photo of him surrounded by Chessmen. Seldom have chess pieces - just the pieces - served such a committed artistic engagement. With considerable thanks to Aphra Shemza via the Anwar Jalal Shemza Estate website; and for their courtesy in allowing use of their copyright images. Sorry about the duplication of the "Posted by...." note (see top and below). Blogger has arbitrarily expunged it as our header and put it at the bottom, so I will add it by hand at the beginning of my longer posts. When I remember.